"I've come across more than 500 _____. As I told you people last year, I have been bitten twice by _____." "Not one _____ scare in thousands has a real _____ behind it." "In one Western city, in a _____ scare, valiant cops would walk along the sidewalk and shoot dogs as they lay asleep on their masters' doorsteps." ALMOST EVERY PERSON GUESSED "PIT BULL." A few people guessed Dobermans. One person said Golden Retriever. All OF THEM WERE WRONG. (One person guessed correctly, but it was on her second try). The answer was: "mad dog," a label used to describe a dog with rabies. 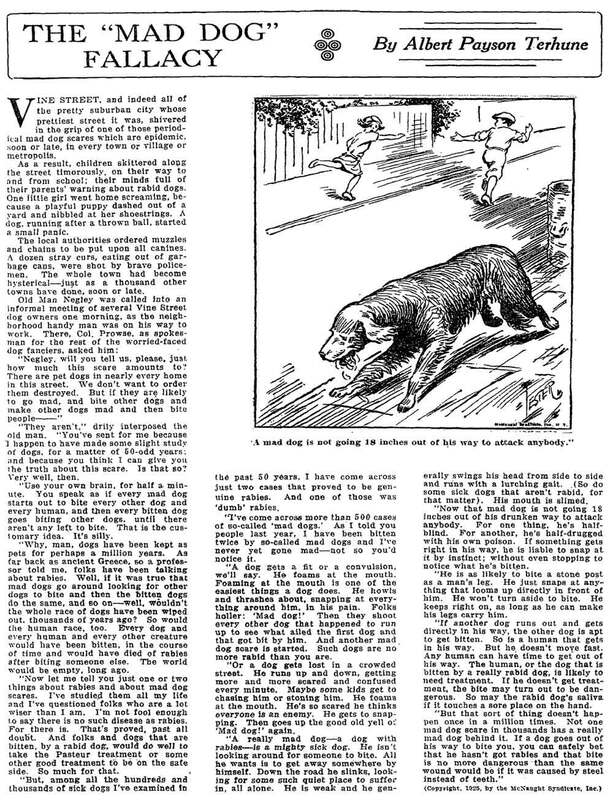 The newspaper excerpts were from 1925 (shown below). "I've come across more than 500 cases of so-called mad dogs. As I told you people last year, I have been bitten twice by so-called mad dogs." "Not one mad dog scare in thousands has a real mad dog behind it." "In one Western city, in a mad dog scare, valiant cops would walk along the sidewalk and shoot dogs as they lay asleep on their masters' doorsteps." * It's important to note that while cases of rabies were higher in 1925 than they are today, those cases were still extremely rare, in comparison to the total population of both dogs and humans. What is most interesting to me is that BREEDS or GROUPS of dogs were not the only subjects of fear in the past. As the above example illustrates, any dog -- regardless of breed, shape, size, or appearance -- can fall victim to hysteria. In other words, THE ISSUE IS NOT ABOUT BREED; it's about the POWER OF FEAR to trump reason and hold ANY AND ALL DOGS captive, often with deadly consequences. Therefore, in our attempts to advocate for and celebrate pit bulls, we must stop placing emphasis on BREED, as breed (or, in most cases, presumed breed or mix of breeds) did not make pit bulls deviant to begin with. FEAR made them deviant. 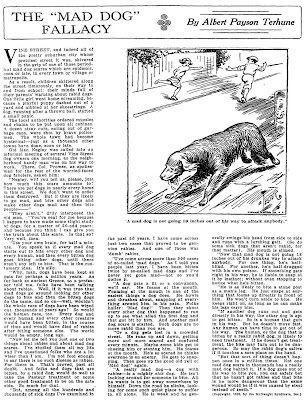 Take the following example from a 1925 newspaper article (shown below) about the mad dog scare, "Why Be Afraid of Dogs?" "A poor harmless street dog gets a fit or is stoned by boys till it's in panic. It snaps at someone. Fear does the rest. The whole town is scared stiff. For weeks, every dog that is off its feed or dumpy or sick or unhappy gets shot as a mad dog. Every dog has to wear a muzzle or be chained up or kept indoors." Wait! This is starting to sound like towns in 2011 that have breed-specific legislation! "A poor harmless dog gets neglected/abused or is exploited by boys till it's in a fit. It bites someone. Fear does the rest. The whole town is scared stiff. For weeks, every dog that has short fur or a seemingly muscular build or blocky-shaped head gets impounded and killed for being a pit bull. In areas that don't have outright pit bulls bans, but have other forms of breed-specific legislation, every pit bull dog has to wear a muzzle or be kept in special enclosures and carry exhorbitant amounts of insurance." A few more examples of how "mad dog" and "pit bull" (and the years 1925 and 2011) could be interchanged. 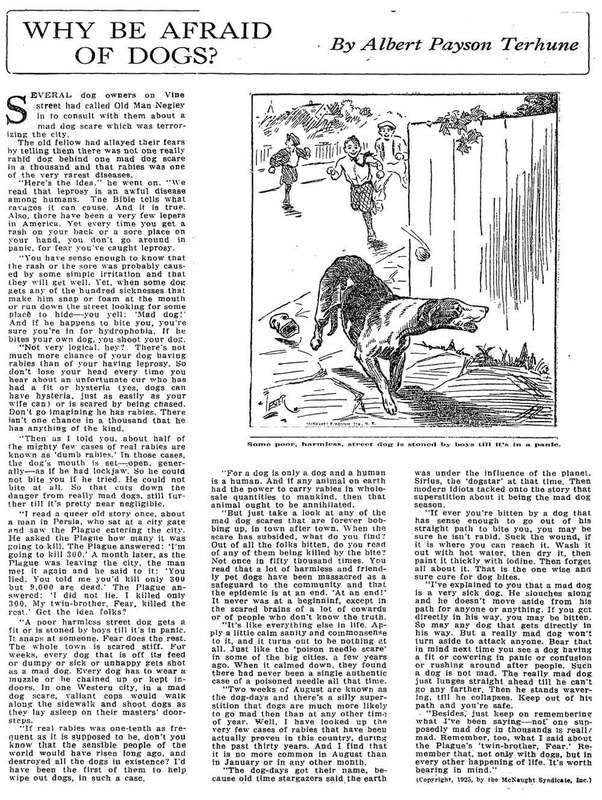 These are excerpts from a 1925 article on "mad dogs," but I inserted "pit bull" after each reference to illustrate my point. "But just take a look at any of the mad dog/pit bull scares that are forever bobbing up, in town after town. When the scare has subsided, what do you find? You read that a lot of harmless and friendly pet dogs have been massacred as a safeguard to the community and that the epidemic is at end. 'At an end!' It never was at a beginning, except in the scared brains of a lot of cowards or of people who don't know the truth." "Use your own brain, for half a minute. You speak as if every mad dog/pit bull starts out to bite every other dog and every human....That is the customary idea. It's silly." "A dog gets lost on a crowded street. He runs up and down, getting more and more scared and confused every minute. Maybe some kids get to chasing him or stoning him. He foams at the mouth. He's so scared he thinks everyone is an enemy. He gets to snapping [biting]. Then goes up the good old yell of 'Mad dog/pit bull' again." 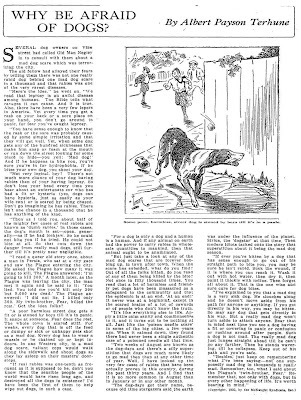 Whereas in 1925 any dog who "snapped" (i.e., bites) was labeled a "mad dog," such is the case in 2011 for "pit bulls." BOTTOM LINE: Fear has the power to make ANY dog a deviant. It's not the breed we should be focusing on. It's the fear. Fear can lead the hysteria for dogs of any breed, type, shape, size, age, or color. Therefore, animal advocates, in our attempts to advocate for pit bulls, it's time we stop keeping the focus on breed and start putting the emphasis back on the root of the problem: FEAR. PS: I'm happy to send my trading card to anyone who wants one! Please send me an email (elderbulls@gmail.com) with your name and mailing address. I'm Sarge and I'm a 16 year old elderbull. After spending the first 14 years of my life with an animal abuser in Philadelphia, humane law enforcement officers rescued me (and 30+ of my friends) in September 2008 and brought us to the Pennsylvania SPCA. I still have scars and injuries from my old life, but they're all external; on the inside, I'm the most peaceful, happy, forgiving dog you'll ever meet. In February 2009 I went home to my new mom and dad (Kim Wolf and Thad Stringer). I live with five other adopted dogs, including my girlfriend, a 9-year-old adopted pug named Mary Todd Lincoln. 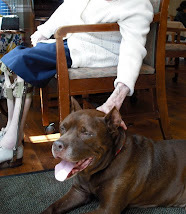 In spring of 2009, I got certified with "Pals for Life" to do pet visitation at nursing homes, rehab centers, libraries, etc. I'm one of the oldest (and most famous!) dogs in the program and everyone loves me, especially the ladies! I also visit schools to educate children about animal issues. I've been on television, in newspapers and magazines, and all over the internet. I love sharing my story with anyone who will listen. Just don't ask me about my gas......it's the only dangerous thing about me.